14 speed Shimano Revoshift gears. Front and rear brakes. Giant Veer 20” Girl’s/Kid’s Bike for sale. 3 speed. Caliper front brake, with coaster rear brake. Used but in very good condition. Hasn’t had much use but our daughter has grown out of it. Please see photos as they form part of item description. Pick up only from Surrey Hills in Melbourne’s east. 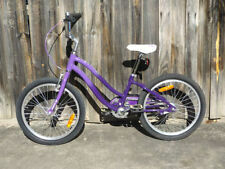 Liv Enchant children’s 20” bicycle, 7 Gears, Great Condition. Condition is Used. Manual included. Pick up Croydon, Melbourne. "Bikemaster"push bike 26 inch ladies bike. 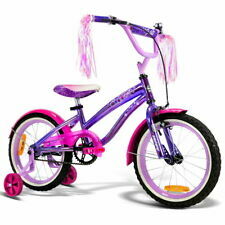 "Bikemaster"push bike 26 inch ladies bike. Condition is Used. Used for about one year. Not used for over 15 years. Purchased new in about 2003. Still in very good cosmetic condition as few scratches and dents. Not tested. Sold as is. See pictures as they form part of description No paypal Cash on pickup in Bulleen Local pickup only. Handlebar Giant Sport, Low Rise 25.4. Stem Giant Sport. Saddle Giant Growing Concept. Pedals Giant Jr. Brake Levers Giant Jr. MTB, Alloy. Tires Giant Junior Lite Sport, 24x1.95", 27TPI. Sizes 24" Wheel. For sale is a Giant Athena ladies Beach Crusier. The bike is a single gear with basket and rack in the back. I n excellent condition. 2 1 s p e e d. F r o n t s u s p e n s i o n.
This sturdy, light weight, balance bike can be used indoors as well as out. - Adjustable seat and handle bar height to grow with your child. The solid rubber tyres ensure a comfortable ride with steel bearings it glides along smoothly and easily for hours of learning adventure. Girls Bike 16'. Condition is good. TREK MT220 Girls Bike - Purple. Condition is Used. It’s 82cm high. I’m not sure what that works out to be in inches. It’s in really good condition although I did notice a little bit of rust where the seats extends up. We paid a few hundred dollars for the bike originally. Its a great quality bike and will be great to use still. It also has a stand which is very handy. 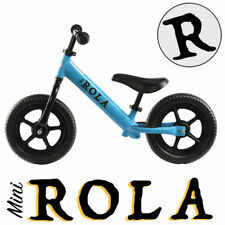 This sturdy, light weight, balance bike can be used indoors as well as out. The solid rubber tyres ensure a comfortable ride with steel bearings it glides along smoothly and easily for hours of learning adventure. Giant Areva kids childrens girls bike bicycle 20 inch white good condition. Condition is Used. Local pickup only. Pick up only. Gregory HIlls. Up for grabs is a Raleigh “freedom” Girls 50cm mountain bike. With 6 speed twist grip gears for small hands. V-brakes front and rear and front suspension. Wheel size is 20x2.0. The bike has been well looked after and serviced. Some surface rust and scratches as you’d expect from wear and tear. My daughter road this bike several times on the Sydney Spring Cycle with ease. She’s outgrown the bike and it needs to go to a good home. Happy to answer any questions. Pickup only from The Ponds NSW 2769. Check out my other listing for boys bike. Giant Girls Bike. Silver Colour. Rear Brake - needs Adjusting. Girls bike - Giant Areva 24"
Girls mountain bike, 21 speed, new grip shift, 1.5" front suspension. Great second hand bike, always kept indoors. Good tyres and everything recently oiled, cleaned and in good working order. The time as come to finally sell this beauty. My 7 year old looks like a circus clown riding it now she’s fully outgrown it. We’ve just done our last 10km on it and is in perfect working condition. The handlebars are sticky (no idea why but can easily be replaced) and the chain is rusted but have never had a problem and as just mentioned, we’ve just finished a 10km with zero problems except my daughter complaining that the bike is too small for her. Also comes with matching training wheels if required. Basket is new and tyres are pumped ready for a new owner to ride it. Happy bidding!! Any questions, just ask. My son has also also outgrown his bike and is listed too, happy to sell both together if required. Kids bike. In great condition as barely used. Kept indoors. S uit age9 -15. 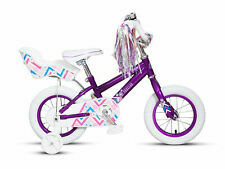 24” Apollo Neo Girls Bicycle. 7 Speed Grip Shift. Seat near new. Bicycle pedal material: plastic. Non-slip pedal: to ensure safe driving. Basket Material: steel wire basket. Chain plate protection cover: prevent the skirt, pants into the chain. Tube material: butyl rubber. Save up to 60%! Buy and save $$! Girls Cruiser Bike. Wheels are roughly 20" so I presume that it is a 20" wheel. Condition is Used. Still in good condition. Has been kept in shed. A few marks and some slight surface rust (see pictures) you would expect from a used bike. Could do with a clean. My daughter is now too big for it. Only pick up available. Girls first bike. Daughter progressed easily from balance bike to this small bike. In good condition. Handle bars a little dirty but otherwise In good condition. Girls bike minnie mouse. Condition is Used. Local pickup only. Girls bike. 12.5 inch wheels pink and white with basket. Girls bike. 12.5 inch wheels. Pink and white with basket. With training wheels. Seat has small tear as per photo. Pick up only from Keilor Downs VIC 3038. Southern Star Flutterfly Bicycle. - pedal back brakes. 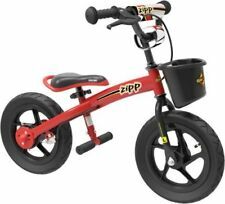 - great 1st bike to learn how to ride, with or without training wheels. - cute little girls bike. - matching training wheels included. - wheel size 12.5 x 2.25. 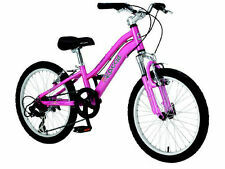 Girls Bike - like new condition - hardly been used. 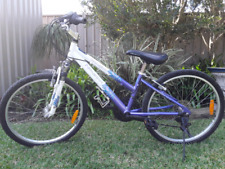 This bike is in great condition and has hardly been used. The low single-speed gearing is very simple to maintain, with just the right gear ratio to allow easy riding over all kinds of terrain. With a paint job and tan accessories to match our adult range, now the whole family can enjoy riding in style. 16 inch girls southern star bike. Has a bit of rust but still in g ood condition. Girl's bike.12" wheels. Plus Helmet. Here is a nice little girl's 2-wheeler bike with 12" wheels (15" if you add the tyres). Both front and back brakes work well and it has a nice comfy seat. Not much else to say, I'm sure your child will be very happy once they get on it and start riding. Condition is Used. Local pickup only. In great condition. Approx 3 years old - has not had a great deal of use as my daughter grew too big for it quickly! The Bionx D500 motor is a powerful animal. A radical new take on the bicycle hub motor, the Bionx D series motors are flatter and thinner that traditional hub motors and fit neatly between the wheel spokes providing more wheel flex for greater grip and traction. Brand new. Never been used, just needs a good dust off as has been stored in garage. Pick up from Sunshine North. Suits from approx 10 years old. 40cm wheels. Disney Princess carriage handlebar feature. Adorable Pricess doll carriage lets her ride with fun! Disney Princess graphics. Draws High chairs Walkers Beds Playgyms Booster Seats Change Tables Car Seats.